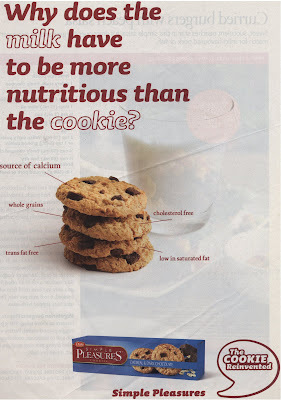 Weighty Matters: Badvertising: Cookies "more nutritious" than milk! Badvertising: Cookies "more nutritious" than milk! Dare Simple Pleasures Oatmeal and Dark Chocolate Cookies. "Why does the milk have to be more nutritious than the cookie." Want to go through their badvertising claims? - Yup. Each cookie contains a whopping 3% of your total daily recommended calcium intake. - Yup. If you look carefully at the ingredients you'll notice that not the first (that's refined wheat flour), not the second (that's pure white table sugar) but the third ingredient is rolled oats. - Yup. So what if the cholesterol a food contains doesn't really have much of a bearing on your blood cholesterol levels? - Yup. Something to brag about. Is there a mainstream cookie left that still has trans-fat? - Yup. 1 gram per cookie. Huzzah? I can only suppose that Dare thinks their customers are either too stupid, too lazy or too misinformed to read actual food labels or think about what they're reading. I wonder what that says about Dare as a company? Listen, go ahead, enjoy a cookie from time to time, but don't kid yourself into thinking it's "nutritious". "Less bad" is not the same as "good".